Update on Feb 28th 2006: I have added the missing diagonal version to the mesh package, please redownload the file called MatchingCornerstoneCurtainsMesh.zip and replace the previous straight version with the new one for the diagonal to work correctly. As requested by MaggieBite, here's a modified version of the Cornerstone Victoriana Velvet Drapes that will match any bedding you have in your game (either Maxis or custom). 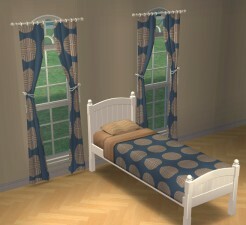 It's a completely separate object from the Maxis curtain with its own GUID, and should not override the original. 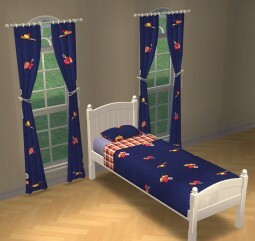 The fabric part of the curtain borrows its texture from any bedding you have in your downloads folder, while the metal/tassel parts of the curtain can be recolored separately (to recolor the fabric, you have to make a recolor of the Colonial Ironwood Bed bedding). There is also a silver recolor of the metal/ tassel parts of the curtain that can be downloaded separately. Redistribution: You can freely share the meshes along with recolors you make as long as the mesh file stays free to download at all times, and you post a link to this thread. The curtains can be freely included in (free) lot downloads. 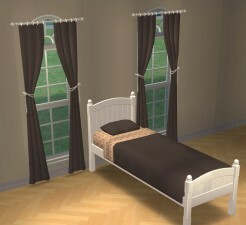 The white bed frame recolor by urshekke can be downloaded here. 1977 people have said thanks to IgnorantBliss for this download.